If your house, shop or other structure has siding, the Dover style cupola might be exactly what you need. Featuring a tiered design along its base that’s designed to match your building’s exterior, this cupola is the smart choice for covering vents or for adding a decorative roof ornament. 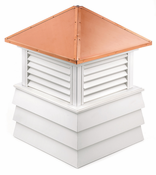 The Dover louvered cupola features a 16-ounce, 24-gauge copper roof with a slope that prevents the accumulation of water or snow. Made from sturdy vinyl, this easy-to-install cupola can be painted to match the exterior colors of your building. Designed to accommodate up to a 10/12 pitch roof, Dover louvered cupolas work with most standard roof structures. They’re available in several sizes, from 18 inches wide by 25 inches high to 84 inches wide by 114 inches high. Because they’re so affordable, you’ll find them on rooftops all over the country. Our expertly crafted Dover® louvered cupola features timeless American style. Measures 18” W x 25” H. Builders rule of thumb: 1.5 inches of cupola width for every foot of unbroken roofline. Measures 22” W x 28” H. Builders rule of thumb: 1.5 inches of cupola width for every foot of unbroken roofline. Measures 26” W x 35” H. Builders rule of thumb: 1.5 inches of cupola width for every foot of unbroken roofline. Measures 30” W x 44” H. Builders rule of thumb: 1.5 inches of cupola width for every foot of unbroken roofline. Measures 36” W x 48” H. Builders rule of thumb: 1.5 inches of cupola width for every foot of unbroken roofline. Measures 42” W x 59” H. Builders rule of thumb: 1.5 inches of cupola width for every foot of unbroken roofline. Measures 48” W x 65” H. Builders rule of thumb: 1.5 inches of cupola width for every foot of unbroken roofline. Measures 54” W x 75” H. Builders rule of thumb: 1.5 inches of cupola width for every foot of unbroken roofline. Measures 60” W x 85” H. Builders rule of thumb: 1.5 inches of cupola width for every foot of unbroken roofline. Measures 72” W x 95” H. Builders rule of thumb: 1.5 inches of cupola width for every foot of unbroken roofline. Measures 84” W x 106” H. Builders rule of thumb: 1.5 inches of cupola width for every foot of unbroken roofline.